Acanthuridae is the family of surgeonfishes, tangs, and unicornfishes. The family includes about 82 extant species. The family is composed of marine fish living in tropical seas, usually around coral reefs. Many of the species are brightly colored. The Atlantic blue tang is found in the western Atlantic Ocean from New York and Bermuda to the Gulf of Mexico, south to Brazil. It is abundant in Florida, Bahamas, and the Caribbean Sea. 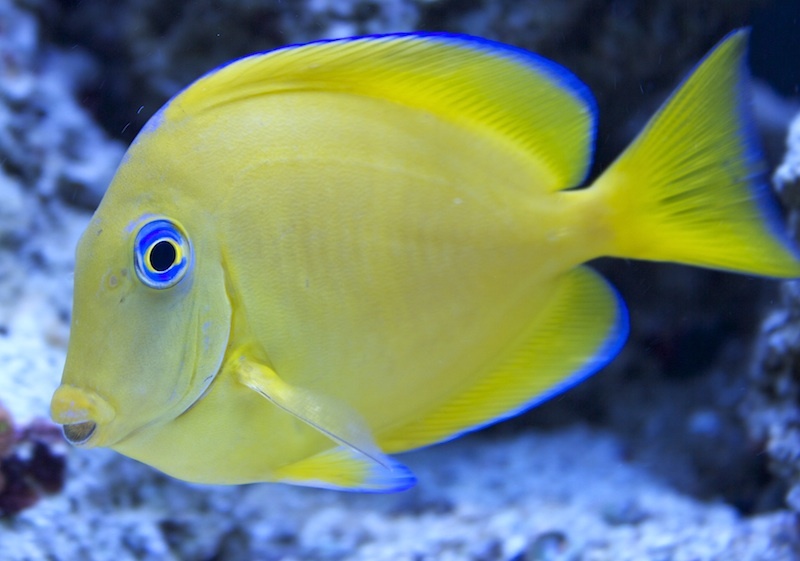 In coral reefs, blue tangs live in holes and crevices where they are sheltered from predators while they sleep at night. The blue tang lives singly, in pairs, or in small groups of up to 10 or 12 individuals, although occasionally it forms large aggregations that forage about the shallow reefs, grazing on algae. This fish has three color phases. In its juvenile phase, it is bright yellow, changing to a mixture of yellow and blue during adolescence. There may be blue crescents above and below the pupils of the eyes. It may be spotted with blue or have a yellow body and blue fins.